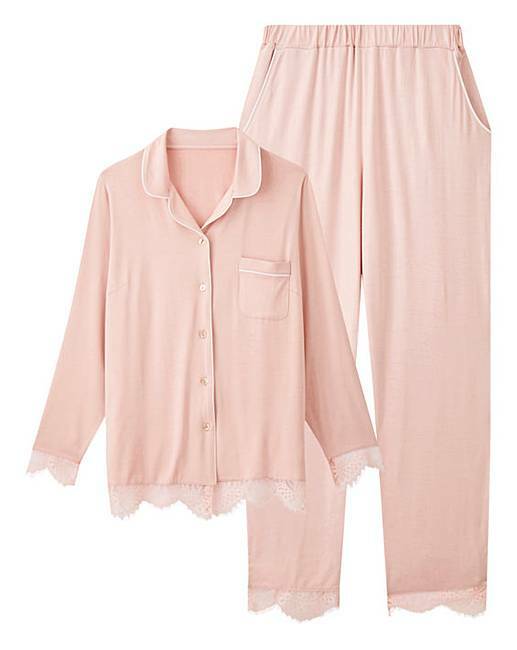 Together Button Through Lace PJ Set is rated 3.0 out of 5 by 1. Looking for something comfortable and cosy? You can't go wrong with our new and exclusive to us range of Together loungewear. Featuring this classic long sleeve, mother-of-pearl button-down pyjama set. Designed in a pretty pink, supersoft and silky jersey fabric with contrast piping detail and cuffs trimmed in a delicate lace. Why not browse the full range? 95% Viscose, 5% Elastane. Lace: Polyester. Rated 3 out of 5 by Chris from Ok I bought this as I liked the design and colour, but unfortunately the stitching isn’t that great only wore twice and started to come apart in one place, also buttons came undone during wearing.for the price I would expect better quality.